To understand the origin of the puzzle, we need to grasp the subtle effect that gravity has on the leftover radiation from the primordial hot plasma at the birth of the universe, known as the “cosmic microwave background”. This radiation has been travelling through the universe for 13.8 billion years, before finally being picked up by instruments on the Planck satellite – allowing us to create temperature maps that have been crucial in understanding the universe . On their journey, the light particles, or photons, of this radiation have encountered both voids and superclusters in the universe. Distribution of galaxies where each point is an individual galaxy, colours represent their distance from Earth. We found that the results were exactly as expected if Einstein’s theory were correct. The newer, more powerful data simply no longer support the old Hawaii result. This conclusion can be tested again when more data become available in the future, such as from the Dark Energy Survey . But for now, the puzzle appears to be no more. Our theories of the universe survive another day. 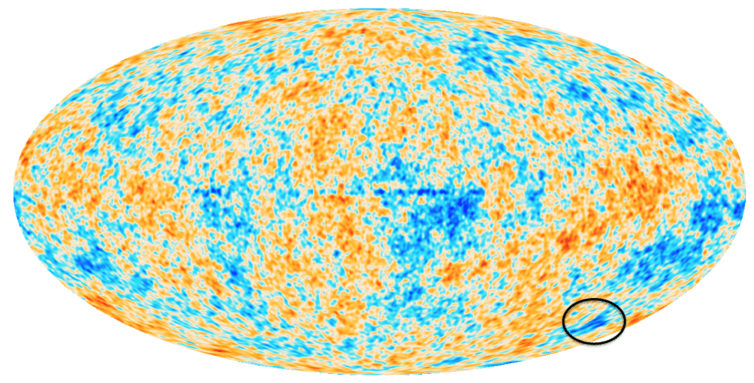 But in resolving one problem, however, we have reopened another – to do with a very large and unusual “cold spot” in Planck’s map of the cosmic microwave background. This spot was first noticed in 2004 , and its physical origin has been a puzzle, since the odds of such a large and cold region appearing in the sky by random chance are small.